There’s not a lot to say about the mayoral race in Wards 23 and 24, Willowdale. Ward 23 is Toronto’s most populated ward, with over 88,000 residents; the ward’s population grew by 11.2% in the last 5 years. The condo boom along Yonge Street between Highway 401 and north of Finch Avenue explains most of this growth. Ward 24’s population is more stable, ranging from affluent neighbourhoods near Bayview Village to low-income apartment neighbourhoods in the ward’s eastern side. John Tory came in first place in both wards, netting 49.0% of the vote in Ward 23, and 47.6% in Ward 24. Doug Ford came in second place in both wards, Olivia Chow coming in third, with approximately 20% of the vote in both wards. 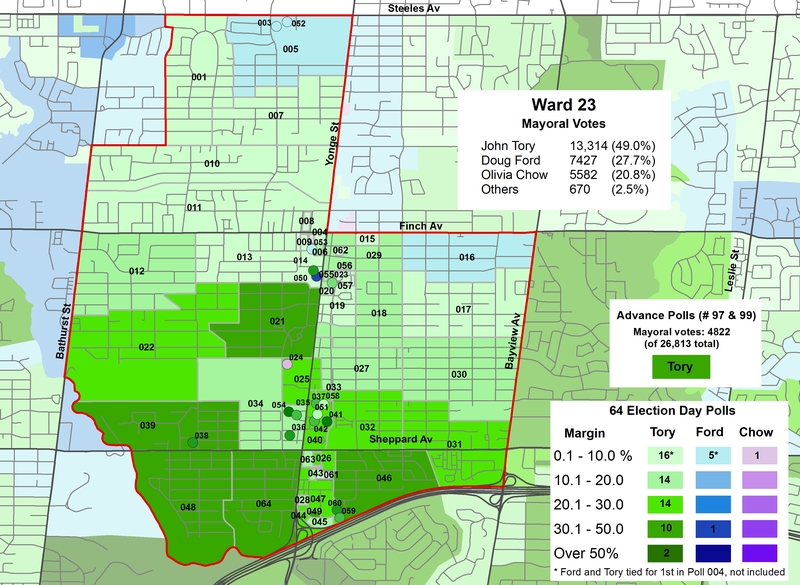 Ford’s best result was in Poll 050 in Ward 23, a TCHC building. 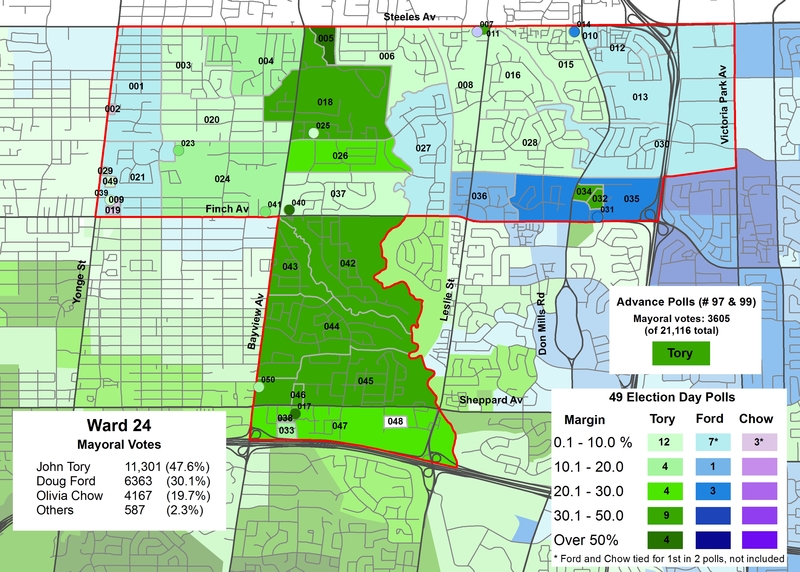 In Ward 24, Ford did the best in the Finch Avenue/Don Mills Road area. The council races were at least more interesting, if not disappointing. In Ward 23, David Mousavi ran against long-time incumbent John Filion, a centre-left councillor who served on North York City Council before amalgamation. Mousavi ran on Filion’s right, with a platform of low tax increases, road improvements, and the extension of the Sheppard Subway to Downsview, as well as a “fresh start” for the ward. John Filion, who was the Chair of the Toronto Board of Health (and champion of the disastrous “A La Cart” food vending program), was the first councillor to back John Tory’s campaign, surprising some election observers who expected that Filion might have backed Olivia Chow. Filion and Mousavi found themselves in a nasty race, with both campaigns accusing each other of dirty politics. In the end, though, the incumbent won; Filion took 55.5% of the vote to Mousavi’s 31.2%. David Mousavi won 8 of 64 polls, all along the Yonge Street corridor. 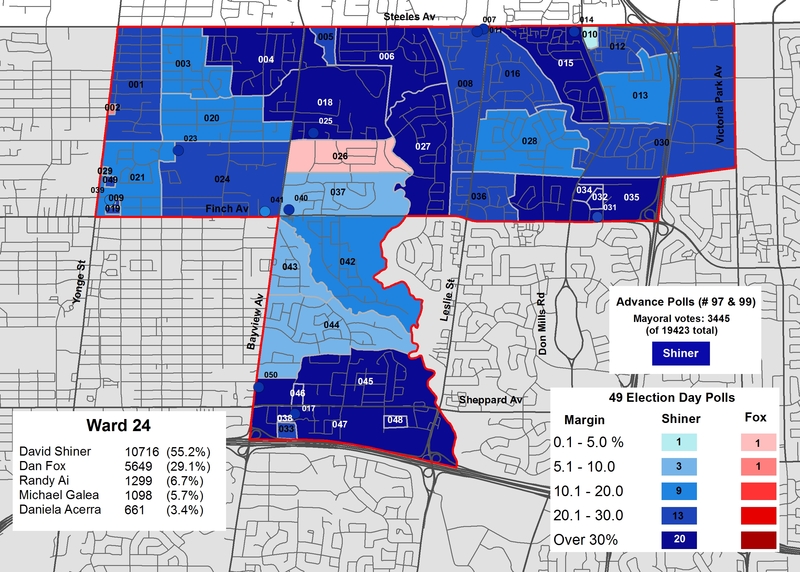 Ward 24 was, in my opinion, terribly disappointing, one of the biggest in the 2014 election. Like Filion, Shiner first served on North York City Council; he was first elected in 1991. During Rob Ford’s term as mayor, Shiner voted with the mayor over 80% of the time, and found himself in hot water for two mini-scandals. In 2013, the Toronto Star reported that Shiner was moonlighting as a federal lobbyist for five years, on behalf of a company that dealt with the city. Also in 2013, the CBC revealed that Shiner (along with Giorgio Mammoliti, Toronto’s worst city councillor) was paying exceptionally cheap rents for an apartment in a building owned by the Greenwin-Verdiroc Group, a major city contractor. As his custom, Shiner didn’t even bother to campaign until very late; he officially registered as a candidate on September 5. Ward 24 was ripe for a change. Fox won the endorsement of the Toronto Star, NOW magazine and others. But like Ward 7, the people of ward 24 stuck with the incumbent, no matter how awful their councillor might be. Fox only won 2 polls, Shiner coasted to victory with 55.2% of the vote to Fox’s 29.1%. This entry was posted in Election, Maps and tagged 2014 Election, North York, Ward 23, Ward 24. Bookmark the permalink.